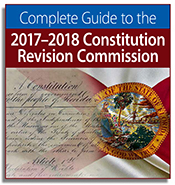 In 1968, the Florida Legislature created the Constitution Revision Commission (CRC) that would meet every 20 years to make changes and additions to the state Constitution. Made up of 37 Florida citizens, this Commission is the only one of its kind in the nation. 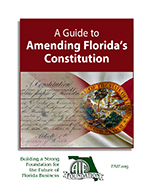 Through a series of public meetings, issue research by appointed subcommittees and thorough discussions, the Commission drafts proposed changes to the Constitution for inclusion on Florida’s general election ballot. • The Attorney General of Florida holds a seat on the Commission. The commissioners come from varying locations, occupations, gender and race, bringing diverse views of Florida’s guiding document. 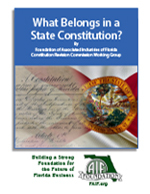 The work of the Commission will be ongoing for one year, during which time they will travel the state gathering public input and researching issues, ultimately drafting proposed constitutional amendments to be placed on the ballot. The public will then vote on those amendments during the elections, where each proposal requires approval by 60% of the voters to pass. The CRC has unique authority that can and has made a major impact on the laws in this state. The mere fact of making law directly in the state Constitution rather than going through the hurdles of normal state law gives this omission a high degree of power. The usual legislative process has layers of checks and balances for proposals to become state law with multiple committees holding hearings in both the House and Senate, an amendment process and vote by each chamber, followed by the final hurdle of approval or veto by the Governor. Along with proposing additions to the state Constitution, the CRC may also remove portions of the Constitution that serve no purpose. Once the CRC goes through its process, its proposals are put directly on the general election ballot for a vote by the public. There are other restraints that the legislative process has that the CRC doesn’t, such as a single subject requirement which can allow the Commission to group proposals together regardless of the subject matter. Moreover, unlike proposed laws from the legislature, there is also no judicial review in place, which again means the CRC has incredible singular power to place whatever proposal the 37 members choose to directly appear on the ballot. With these unique powers possessed by the CRC, the Florida business community must be aware that those who oppose the free enterprise system and who do not believe that a strong business environment is paramount to the success of Florida will be front and center at every public meeting seeking to get unfair legal issues, burdensome regulations and extreme environmental policies into state law.